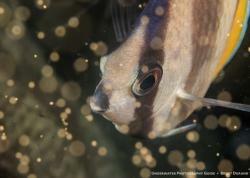 Capturing a great shot of a fish, particularly when you are a new underwater photographer, can be thrilling. More is better, so knowing what species of fish travel in pairs and where to find them can mean the difference between a good shot and a great shot. 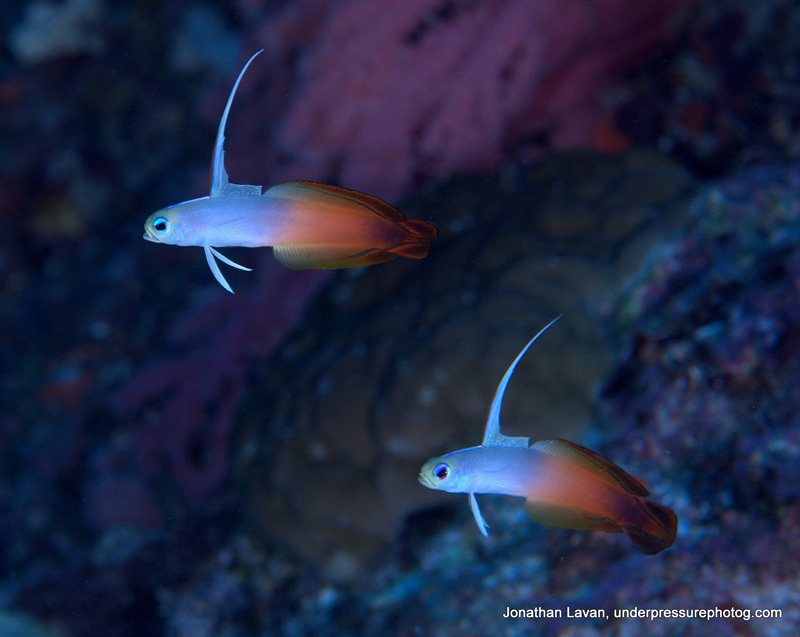 Many fish mate for life or group together as juveniles for safety. We’ll take a look at a few of these fish, what part of the world they live in and what angles and arrangements make the best shot. 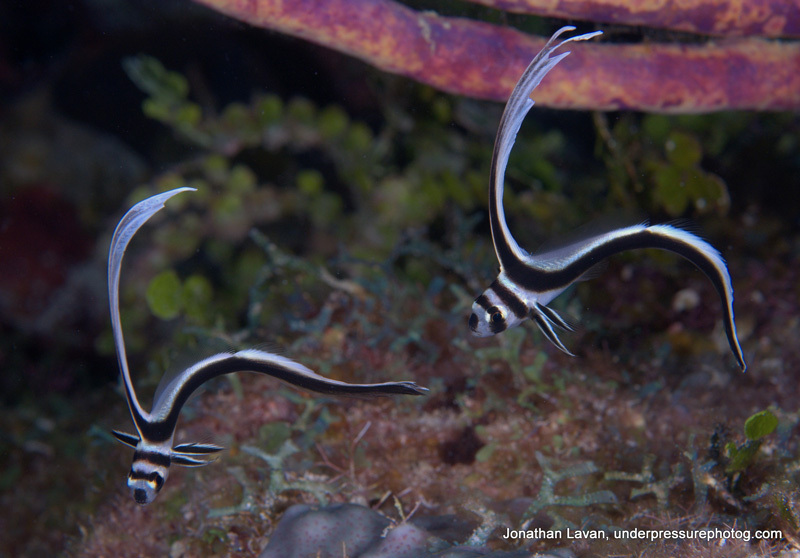 Our first shot is of a pair of juvenile Spotted Drums from Grand Cayman in the Caribbean. 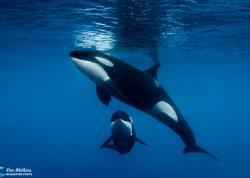 Adult Drums are usually solitary but juveniles are almost always found in pairs or larger groups. They have the wonderful habit of swimming around each other in little circles. Their dorsal fin and tail fin are very long and flexible (they shrink in length with age) and are constantly changing position and angle. Their black and white color on the colorful background of the reef also makes for a nice capture. 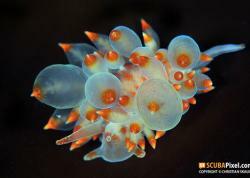 They are usually found in medium depths, hiding in little depressions in the reef frequently in front of or amongst the spines of the black Long-spined Sea Urchin. Now we will move to the Sea of Cortez off the Midriff Islands. Taking photos of Moray Eels is always a good starting place for the novice underwater photographer as they are dynamic in their look and tend to be quite stationary. However in most areas where they live they are solitary. In our second shot we find a wonderful exception. 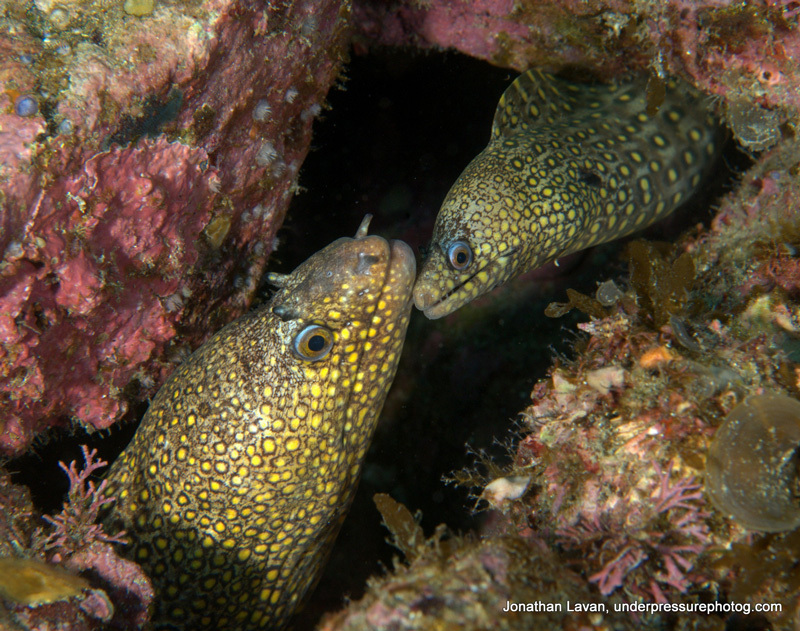 A pair of beautifully patterned and colored Jewel Moray Eels. Whether this is a mated pair, an adult and a juvenile or just a couple of eels remains to be seen. The most common opportunity to shoot eels you find together is side by side, so to find these eels juxtaposed like this was rare and naturally made a well-composed shot. Our next couple of shots come from Fiji. Fiji is not far from the Coral Triangle, and is the source of life on earth and an area of incredible bio-diversity. 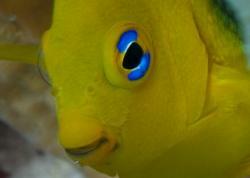 Butterflyfish mate for life so are a fish you will almost always find in pairs. In the Caribbean there are half a dozen different species while in Fiji and surrounding areas there are over 80 different species - so many opportunities for finding pretty pairs. 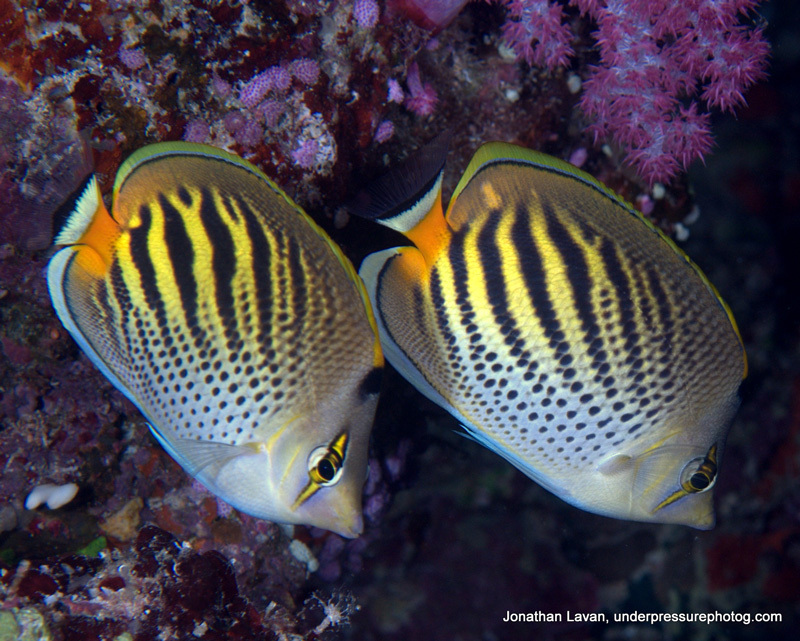 These Dot & Dash Butterflyfish are particularly colorful. Butterflyfish tend to dart around quite a bit, so it is good advice to approach slowly, keep changing your angle in relationship to the fish, try to move in one continuous motion and take plenty of shots. It is often hard to get both fish in the frame so you will need to be patient. Take enough time to experiment and try out different lens to see what will work best. A 60mm will give you clean framing of a pair while a 105mm will get you closer to your subjects without spooking them. Dartfish and Fire Dartfish in particular are beautiful and found only in the Indo-Pacific. It can be a bit challenging to capture a shot because, as their name would suggest, they have a bad habit of disappearing very quickly into a hole in the ground. The female hovers closer to the burrow than the male and will dart into it first, so you may only have seconds to grab the shot. As always, patience and becoming one with the water are your best advice. And finally, as with all fish photography, start shooting on your initial approach to the fish. It is always better to take ten shots from too far away than to miss the one good shot that you do get. Knowing as much as you can about the animal’s behavior, habits and habitats they frequent will enable you to realize many great shots that would otherwise go unrealized. Happy fish watching, great captures and safe diving! The owner/operator of Underpressure Diving & Nature Photography is a citizen scientist and wildlife expert and has been SCUBA Diving for thirty years and taking photographs both above and below the water for about 10. Jonathan is committed to making a difference on this planet through his images and his message of good will to all creatures.